This oven baked Spanish Rice recipe is perfect every time I make it. It’s so easy and everyone asks for the recipe - so make sure you bookmark this one! 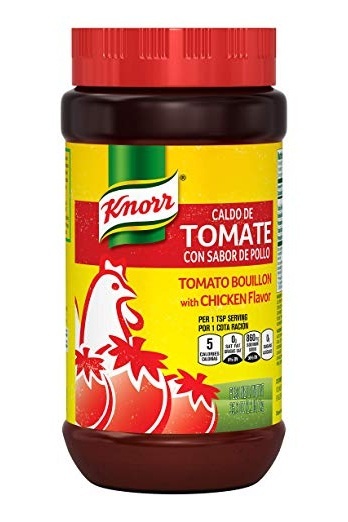 The secret to this recipe is the Knorr Tomato Chicken Bullion. You can substitute chicken broth but I assure you the flavor will not be the same unless you use this exact product. You can find it at your local grocery store or order some from Amazon. Preheat oven to 350 degrees. Combine water, bullion, tomato paste, and Rotel in a bowl, set aside. In a 9x13 pan combine all ingredients with water mixture and stir so that everything is evenly distributed. Cover tightly with foil. Place carefully in oven and bake for 1 hour 15 minutes. Remove from oven and leave covered until ready to serve. Onions and garlic may settle on the top, Fluff with a fork to mix them evenly into rice.